Johnny Moss proved that he still had some gas left in his poker tank at the 1988 World Series of Poker, and he won his ninth and final gold bracelet in the $1,500 ace-to-five lowball event. He also finished runner up in the preliminary $1,500 seven-card stud event. Although his showing was impressive, it was shown up by the showing of another Johnny that year, one who followed in Moss’ footsteps as a back-to-back world champion. Moss made a respectable showing in the main event as well, where he survived to the second day, but eventually failed to cash in the top 36 players. While Moss was able to put together a nice run, Johnny Chan was putting together another dominant run to the final table. He took the chip lead into the final nine with 529,000. Chan had found a higher level of confidence with a world championship bracelet around his wrist, and he made a habit out of mercilessly attacking any opponent he perceived to be weak. The strategy worked for Chan in the preliminary days of the tournament, but weak opponents were much harder to find at the final table that year. Chan faced eight players that included: Jesse Alto (making his sixth and final, final-table appearance), Mike Cox, Quinton Nixon, Jim Bechtel, T.J. Cloutier, Humberto Brenes, Ronald Graham, and the Mayfair Club representative that year, Erik Seidel. Alto (ninth), Cox (eighth), Nixon (seventh), and Bechtel (sixth) all fell rather quickly at the final table, and then as had become the case for Cloutier, he met a cruel and unusual end to his tournament run. First, he called an all-in bet from Brenes holding A Q , and Brenes revealed he was in trouble when he flipped over 9-6. But a 9 and a 6 on the flop were joined by another 9 on the river to give Brenes more than enough to double up. Cloutier was now reeling, and on the very next hand he raised 50,000 preflop with A 10 . Seidel, holding pocket fives, reraised enough to put Cloutier to a decision for his tournament life. Cloutier made the call and again the board was cruel to Cloutier when it gave Seidel a 5 on the flop. Seidel continued his solid run by knocking out Brenes (fourth) next and then Graham (third). This left Seidel heads up with Chan for the bracelet. “I remember looking at the whole scene, and thinking, ‘What in the world am I doing here playing heads up for the world championship?’ It was pretty awful to be in such a great spot and to be so unprepared for it,” said Seidel. 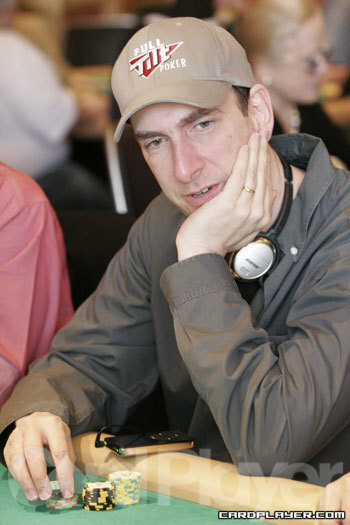 Seidel was in fact green to the game of poker at that point of his career, and he certainly wasn’t the world-class player that he is today. But, whatever experience advantage he gave away to Chan at the beginning of heads-up play he made up for it with the chip advantage he held. Chan was able to pull even with Seidel during the opening section of the match, but then Chan’s pocket eights ran into the pocket nines of Seidel in a crucial confrontation. Seidel won the hand to double up and he took a three-to-one chip lead. Once again, Chan fought his way back to even, and the next crucial pot had a decidedly different outcome. The cards of the final hand of the 1988 WSOP are known to poker players and fans throughout the world, as well as to members of the general public who have watched the hand play out in the classic scene from the movie Rounders. Chan was dealt J 9 in the hole, and he limped to a flop of Q 10 8 . Seidel had checked preflop with Q 7 . 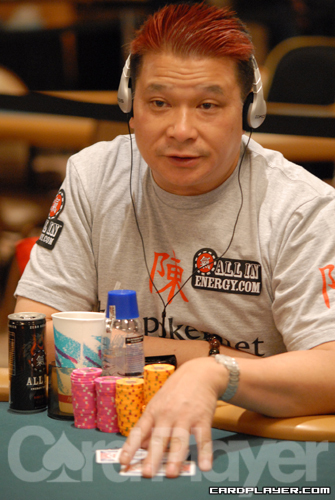 Chan led out for 40,000 after the flop, and he was raised by Seidel an additional 50,000. Chan reluctantly made the call in one of the best acting jobs in poker history. The 2 fell on the turn and both players checked as Chan kept up the act. The river rolled out the 6 and Seidel moved all in. Chan quickly made the call and he showed down the nut straight. Chan was the fourth back-to-back champion in WSOP history and he won his second title in the most exciting final hand in WSOP history. It is most likely that Chan will be last player to ever accomplish the feat of consecutive world championships, cementing his WSOP legend.